A morning coffee without the cars; there is no motorised traffic in Ljubljana (photo: Celica). 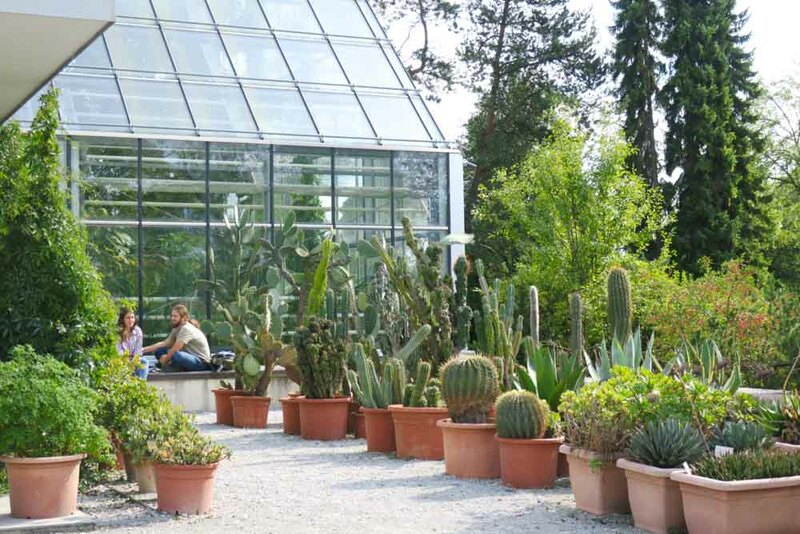 Take a break in Ljubljana Botanical Garden (photo: Elspeth Callender). 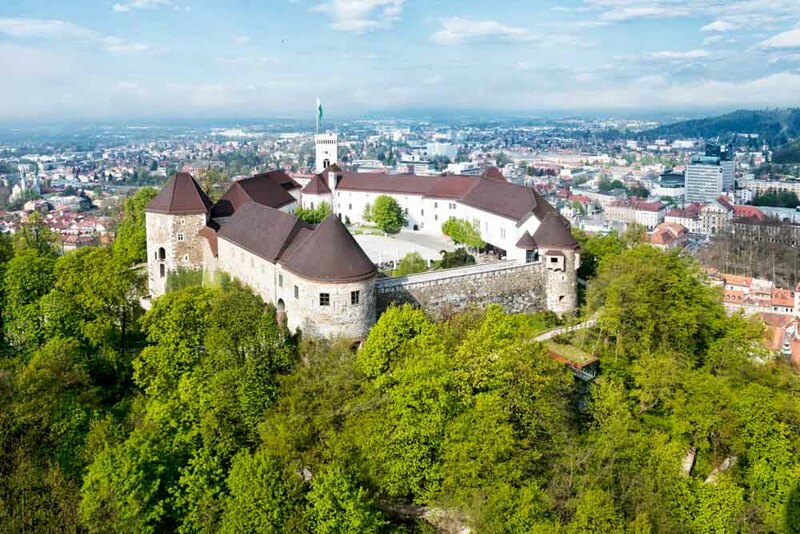 Ariel view of Ljubljana Castle (photo: Arne Hodalič). 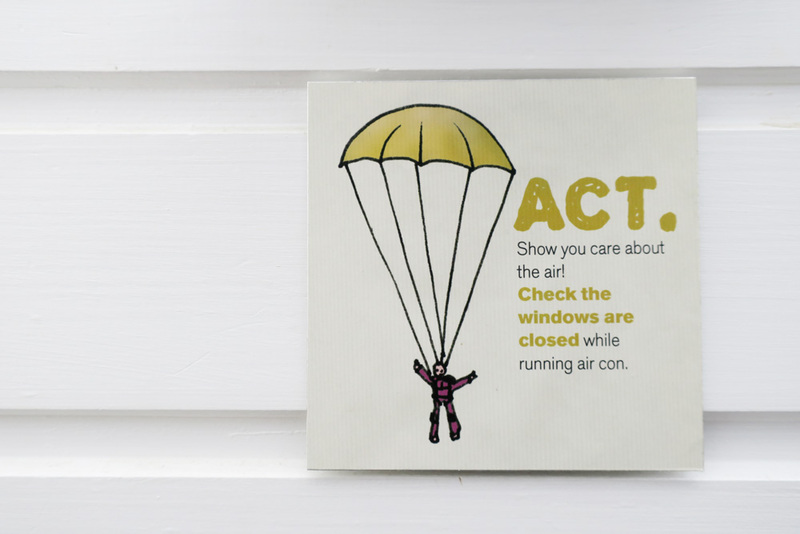 A gentle reminder at Celica eco-hostel to keep Ljubljana environmentally friendly (photo: Elspeth Callender). 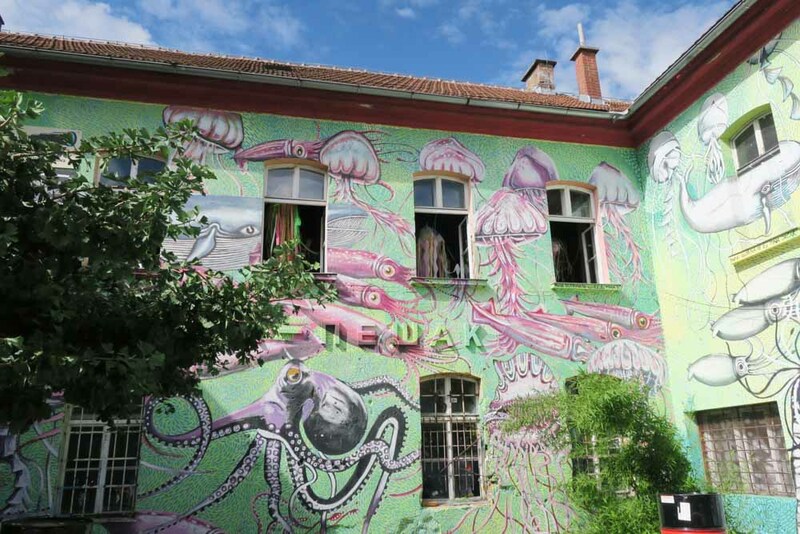 The colourful cultural district of Metelkova Mesto in Ljubljana (photo: Elspeth Callender). 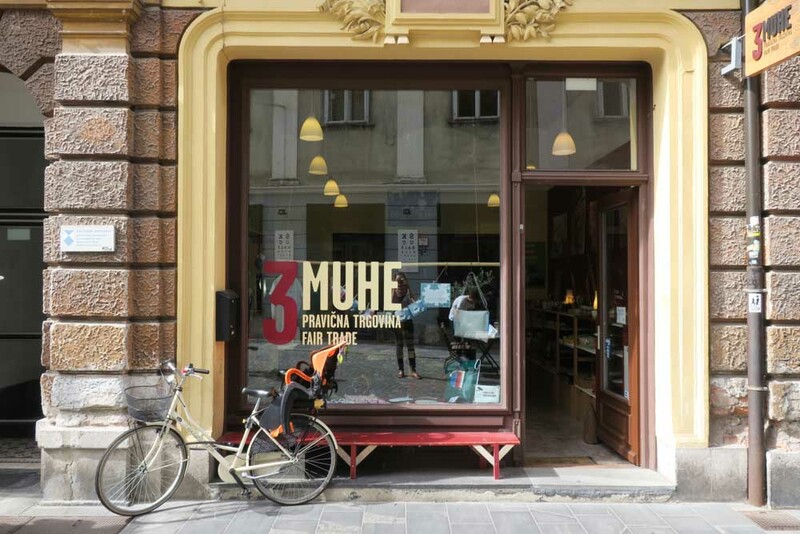 Buy fair trade and Slovenian products at 3Muhe in Old Town (photo: Elspeth Callender). 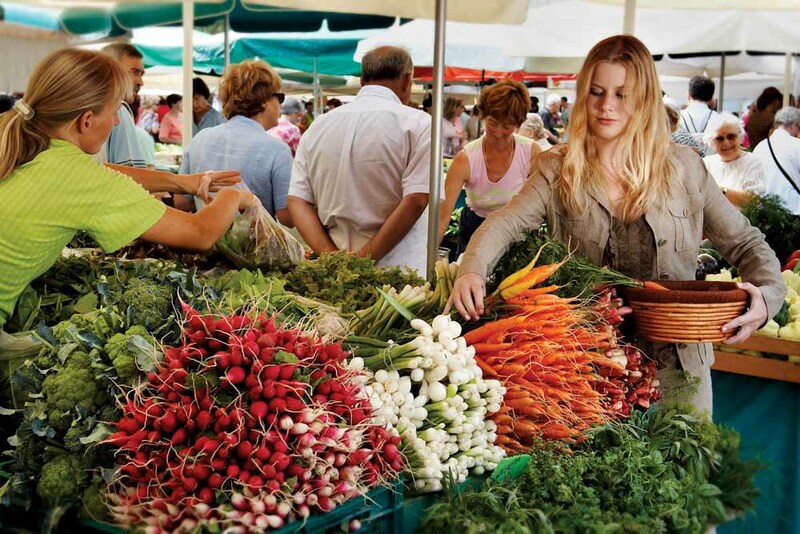 Do some shopping at Ljubljana's Central Market for fresh produce (photo: B Jakše & S Jeršič). Slovenia’s main city Ljubljana is the being touted as Europe’s Green Capital, which has as much to with caring for others as it does with recycling rubbish, finds Elspeth Callender. Sitting at the foot of a hill castle in the centre of a small chicken-shaped country is what, on first impressions, appears to be a typical medium-sized Central European city. Slovenia borders Italy, Austria, Hungary, Croatia and the Adriatic so its compact capital has long been overshadowed by Venice, Milan, Vienna, Salzburg and Zagreb. 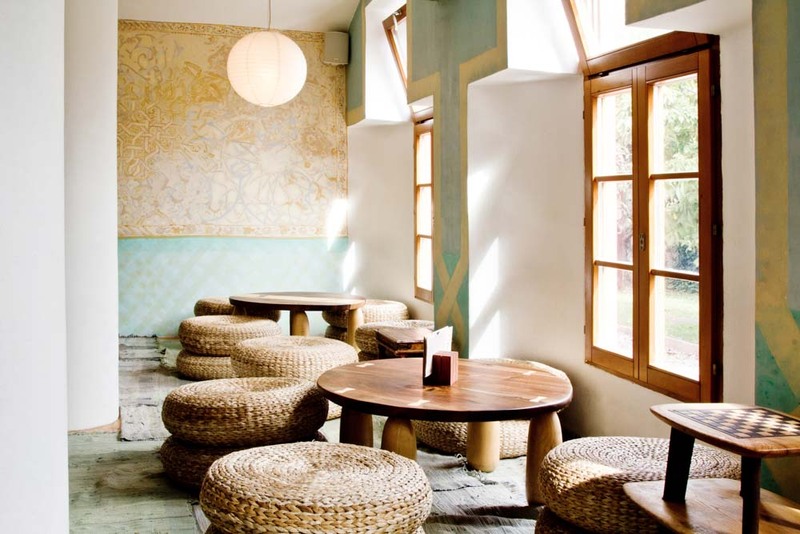 But this year Ljubljana has quietly achieved something to set itself apart from, and perhaps even inspire, these better-known centres. Under a visionary mayor and after a decade of ambitious goal-setting, Ljubljana was named European Green Capital of 2016 – a first for Eastern or Central Europe and any of the countries petalled around Slovenia. Striving for the award created such momentum that now being green and getting greener is a way of life in Ljubljana, and visitors not only reap the benefits but are invited to get in on the action. What’s initially most striking about this 290,000-person city, aside from being so darned pretty, is that its paved centre is closed to motorised traffic. There are no fumes, no engine noises, no horns, no congestion. The banks of the Ljubljanica are dominated by cafe tables, gelato stands and people socialising in the sunshine. A handful of electric people-movers meander around the centre picking up anyone who wants or needs a lift, but pedestrians and cyclists essentially own the squares and streets of Old Town, the Central Market, Triple Bridge, Prešeren Square and the gritty, graffitied Trubarjeva Street. Ljubljana is built on a plain, its parks and forests account for nearly three-quarters of the city and there are around 230 kilometres of managed cycling routes. For getting around town, following the waterways or travelling further out to places like the city’s ‘lungs’ at Ljubljana Marshes, biking is really the best way, in every way, to explore the Green Capital. Bikes are available for hire at the Tourism Information Centre near Krek Square or through the self-service bike-sharing system Bicike(LJ). At the town hall I meet Kristina Novak, who’s part of the eight-person European Green Capital 2016 team. We drink espresso and Ljubljana’s untreated tap water while discussing the government’s ‘Vision 2025’ and some of the “1700 projects already implemented in relation to Green Capital”. These schemes have improved air quality, expanded green spaces, reduced light and noise pollution, revolutionised waste and water management, inspired outdoor exercise, increased urban beekeeping, improved accessibility, made businesses more socially responsible, and encouraged sustainable tourism. Mayor Zoran Janković puts his head in the door during our meeting just to say hi. The mayor “meets with people all the time to see how the projects are affecting their lives,” Kristina explains after he leaves. In order for Ljubljana to practise sustainable consumption and become a more circular economy, innovative solutions are encouraged. An urban electric train, re-establishment of the castle’s vineyard, paper production using invasive weeds and outdoor libraries are examples. Summer reading sites for Library Under the Treetops include Tivoli Park, Ljubljana Castle and the Mala Ulica Family Centre where there’s a vertical garden technologically controlled to stay green through winter. When Slovenska Street recently became a shared pedestrian, bike and bus mall, the ash saplings chosen to line this road were picked for their bee- and butterfly-attracting flowers. Outside the town hall are two converted shipping containers creating a space called ‘Point. For you.’ with interactive displays and regular workshops to “encourage residents and visitors to make Ljubljana even more green, clean, hospitable and friendly,” says Kristina. A five-minute cycle from Old Town is the world’s first certified eco-hostel. Celica is a repurposed military prison within the former Yugoslav National Army military barracks in what is now the autonomous cultural zone of Metelkova Mesto. As Tanja Lipovec shows me some of their creatively renovated cells, she stresses that the hostel’s eco-friendliness relates to far more than separating waste. It’s about “doing things with purpose… thinking about the future and what you leave behind… how you promote your local environment”. Guests, she says, can participate by being mindful of energy consumption and buying local products when out shopping. Dotted around the city are stores dedicated to selling Slovenian-made goods: Idrija lace, Prekmurje black pottery, Polonapolona porcelain, Smetumet bags, Carniolan bee honey and Adriatic sea salt products. Some restaurants employ, as part of their staff, young people who’ve had limited education, people with disabilities or mental illness, and immigrants struggling to find work. Thrift store Stara Roba, Nova Raba – ‘old goods, new use’ – only employs people who’ve experienced homelessness or unemployment, and all profits go to paying their wages. Luna Jurančič Šribar has just completed her PhD on “how to bring alternative economics into a capitalistic system” and she and her staff show off some Yugoslav coffee sets and Slovenian ceramics no longer in production. There’s also a portrait of Marshal Tito for sale. CurioCity’s From Ljubljana With Love tour focuses heavily on these types of socially responsible businesses. “We didn’t want to talk about dead people, we wanted to talk about things that are happening here now,” says Uroš Trauner as he and I walk the revitalised Trnovo embankment then through one of the city’s oldest suburbs, Krakovo, where Ljubljana Summer Festival events are held within the medieval walls of the Križanke Outdoor Theatre. Back in the city centre, we step into Galerija Emporium to admire the gloriously restored fin-de-siècle staircase. When I return to ‘Point. For you.’ at the end of the week, I recognise all the places in the before-and-after photographs on display. I realise I’ve filled my water bottle at historic fountains that, a few years ago, were treated as traffic roundabouts and I’ve wandered squares previously packed with parked cars. I bump into Kristina Novak who’s been attending a workshop and is about to cycle home. We get chatting about a mobile app currently being developed for locating the nearest drinking water when biking or walking the 34-kilometre Trail of Remembrance and Comradeship. Seven thousand trees line the circular path and there’s an adjoining orchard where everyone’s encouraged to take fruit for free. “It’s beautiful,” she says, almost shaking with excitement. Someone rips past us on an ear-splitting motorised bike, but Kristina doesn’t flinch. Slovenians are generally pretty chilled and ‘kindness’ is something Ljubljana residents tell me they miss when they’re travelling away from their safe little city. And, because Ljubljana is being greened and not sanitised, the technologically advanced upgrades and the restoration of historic infrastructure continue to co-exist with street art and two major urban squats, so the place still feels interesting, edgy, and real. As we’re about to part, Kristina confesses that she’d always hoped to be able to look back on her life and feel she’d done something worthwhile, and now knows for certain she will. As Tanja said, in the shade of Celica’s cherry tree, “when you live the story, only good things come of it”.